Given the vast complexities and sensitive nature of high risk obstetrics, it should be no surprise that malpractice litigation in this specialty ranks highest in average indemnity paid according to a recent industry information. It is common for healthcare providers to implement proactive patient safety initiatives as a way to prevent the adverse events that can often lead to significant financial losses. Unfortunately, often times the positive impact of these initiatives are short lived. Each component of our RSQ® Cycle brings physicians and nurses together and focuses on the most critical, high-risk issues in obstetrics. 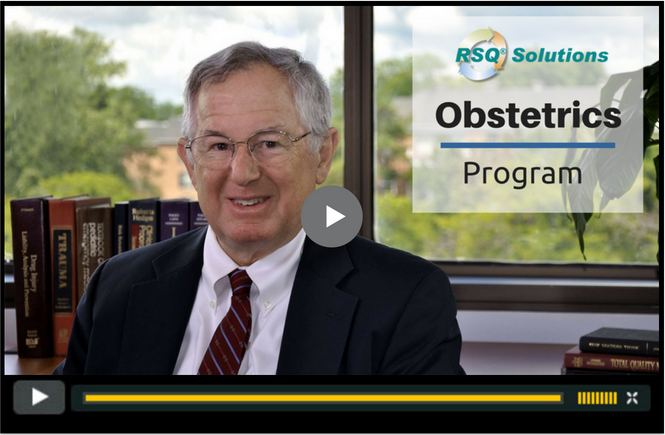 View the full RSQ® Solutions - Obstetrics Education course list. RSQ® Simulation Training introduces and reinforces the vital elements of clinical competence and team communication that are essential to enable your physicians and nurses to perform with a high level of success during an obstetrical emergency. Prior to hosting their event, clients will receive the following elements of the training program. Perhaps the most powerful aspect of the RSQ® Solutions - Obstetrics Program is our analytic tool designed to measure the clinical risk profile of a particular Labor and Delivery unit. The RSQ® Assessment - Obstetrics has the capacity to drill down to the indi­vidual practitioner, allowing clinical leadership to easily identify variability in practice amongst their providers. Read more about how HCA used the RSQ® Assessment – Obstetrics to measure compliance with standards of care and to inform process improvement.